The first step in constructing a garage on a slope is to find out how much the land slopes over the length or width of the garage. Once you know that, you can construct a proper foundation that accommodates the slope. 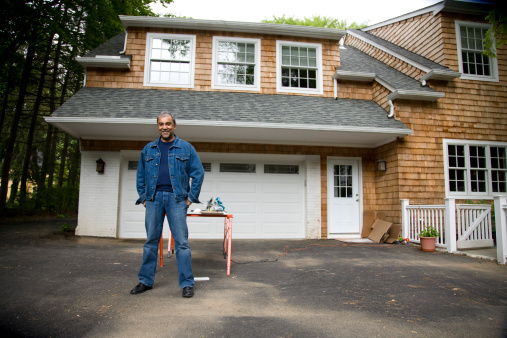 With the foundation in place there are no other considerations related to the slope, so you can build the garage using normally accepted building materials and practices. 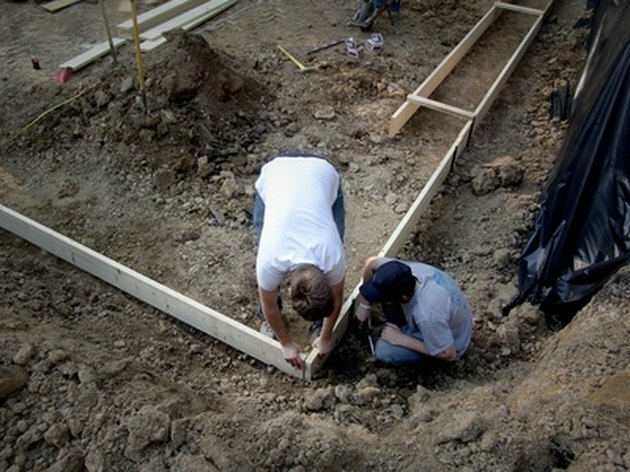 Fitting the foundation to the ground is a critical part of building. Stake out the four corners of the garage by using the hammer to drive a stake into the ground at the left, rear corner. Use the tape measure to measure the distance to the right rear corner and drive a stake there. Continue measuring and staking the final two corners based on the dimensions of the garage. Attach string to the top of the first stake and extend it to the next stake, wrapping it around the top, and then to the other two stakes, tying it to the last stake. Square up the layout by multiplying the length by itself, the width by itself and then adding them together. Find the square root of the result using the calculator. The result is the hypotenuse of the right triangle that is formed by three of the stakes. Measure from the left, rear stake to the right, front stake and compare the result to the calculated hypotenuse. Move the front stakes left or right until the measurement from the left corner stake to the right front stake matches the hypotenuse. Look through the site level at the leveling rod held by a helper on the ground at the left, rear corner stake. Record the elevation. Do the same to get the ground elevation at each stake. Remove the soil that is higher than the lowest point of the layout if it is a foot or less, to bring the layout into level. Add clean fill, or gravel in 4-inch increments while compacting it with the compactor if the difference between the highest point and lowest point is more than a foot. Excavate the footers using the backhoe, set the concrete forms and pour the foundation following local codes for footer depth, reinforcement and concrete strength. Install anchor bolts around the foundation perimeter at 6-feet on-center. Build the walls, add the roof, install windows and doors, put on the siding of choice, and bring the driveway to the door.